On August 21, 2017 an event rich in history and scientific allure will occur–a solar eclipse. In Mount Prospect at 1:19 PM the moon will cover 86.5 % of the sun. To witness a total eclipse, one would have to travel over 200 miles south to the Carbondale, Illinois area. The Adler Planetarium is making the most of this event despite there being only a partial eclipse in our area. At its website there is information about viewing events and tips for viewing the partial eclipse safely. The Adler Planetarium explains where to purchase the special viewing glasses and how to make your own special viewing tool. To be part of a viewing event closer to home, go to the Harper College Campus. From noon to 2 pm on August 21 three telescopes equipped with solar filters will be set up and a limited number of solar viewers will be available in front of the Avante Center (Building Z) on the college’s main campus, 1200 W. Algonquin Road in Palatine. The Library offers many resources for preparing for this eclipse. 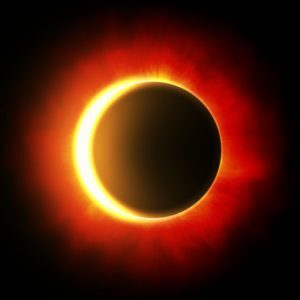 There are two new books which discuss how eclipses occur, how astronomers studied them in the past and the continued fascination humans have for this wondrous astronomical event. Look for American Eclipse by David Baron and Eclipse: Journeys to the Dark Side of the Moon by Frank Close. The Library’s online resources also offer many ways to better understand this event. May your experience of being in the shadow of the moon be a memorable (and safe) one!